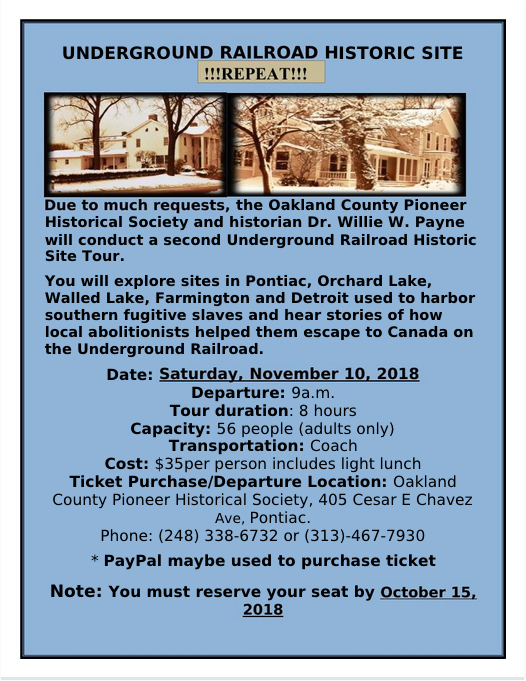 In conjunction with Oakland County Pioneer Historical Society, historian Willie W. Payne will showcase sites in Pontiac, West Bloomfield, Walled Lake, Farmington and Detroit used to harbor southern fugitive slaves escaping to Canada on the Underground Railroad. Tour duration. 9 a.m.- 5 p.m. Cost: $35.00 per person (includes light lunch) The tour is sold out.